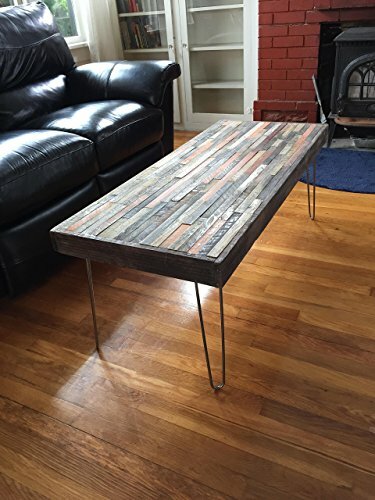 A beautiful, modern and rustic mosaic coffee table made with reclaimed barn wood - showing its naturally aged character. It features handmade steel hairpin legs. Size shown in pictures is 42"W x 22"D x 18"H. Price shown is the sale price. Prices vary by size. CUSTOM SIZES AVAILABLE UPON REQUEST. PLEASE EMAIL FOR A QUICK PRICE QUOTE. This is a custom made product. Handmade in the USA. Quick&Tool-less® assembly required. Please allow 1-2 weeks to ship.